When’s the last time you really sat down and considered how much energy and water your water heater is using? If you’ve got a traditional tank unit, you’re using quite a bit. Of course, all those hot showers and warm baths are nice, but do you have more than you might need? If you’re in the appliance-researching mood, you might’ve come across the possibility of having a tankless water heater installed. That sounds intriguing, you might think, but why should you consider switching your water heater out for one of these models? We can’t answer that for you, but the pros at Roman Electric can help you learn a little bit more about the pros and cons of a tankless water heater. This is the biggest reason why someone would probably want to switch. Perhaps you’re tired of spending too much on energy bills to heat your water every month. 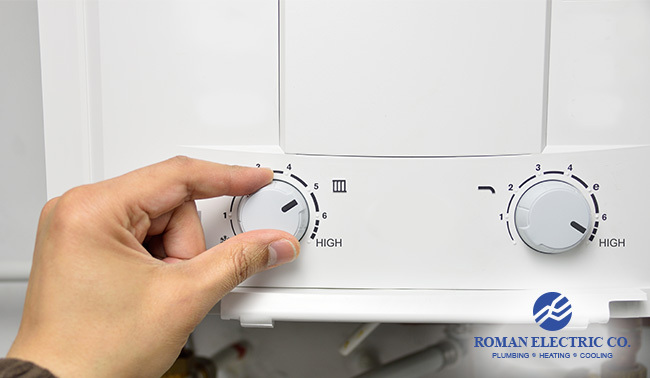 A traditional water heater warms up a significant amount of water, which sits in the tank until you use it. A tankless water heater, though, only heats up water when you need it. This means you’re not spending money on hot water you may not need. You get only what your appliances call for. However, if you do in fact need a lot of water, then this isn’t much help. You’ll run out much quicker, and the tankless water heater might not be able to keep up. Unlike a tank-unit water heater, a tankless model doesn’t require a big space carved out for it to sit in. A tankless water heater can fit in a closet, mounted on a wall, so you might not even realize it’s there most of the time. The other side of that diminutive size is that since it’s smaller, it’s easier for things like calcium and other sediments to build up in the pipes and clog it up. Another advantage to owning a tankless water heater is how much it’ll save you in the long run, outside of energy bills. A tankless unit lasts longer than a traditional one does – some can have a shelf life more than double that of a tank unit. However, that comes with a price, so to speak. A tankless water heater often costs several times what a tank-unit water heater does up front, so the money you save on energy bills will almost certainly take several years to cancel out the difference in installation cost. Unfortunately there isn’t a clear-cut answer to whether you should get a tankless water heater or not. Everyone’s situation is different, and we can’t make a judgement call for you without taking stock of your home’s needs and specifications. We can, however, talk with you to figure it out! Roman Electric has plenty of experience and knowledge regarding water heaters, and we’d love to speak with you to talk about what you’re looking for in a water heater. Give us a call at 414-771-5400 today!